Available In 2 Sizes. You Can Measure Around Your Neck With A Tape Measure Or Use Your Shirt Collar Size. The Regular Size (Red), Fits Neck Sizes Of 14 To 16 Inches, And The Large (Blue) Fits Neck Sizes 16 To 18 Inches. If You Are In Between Sizes, Choose The Large. 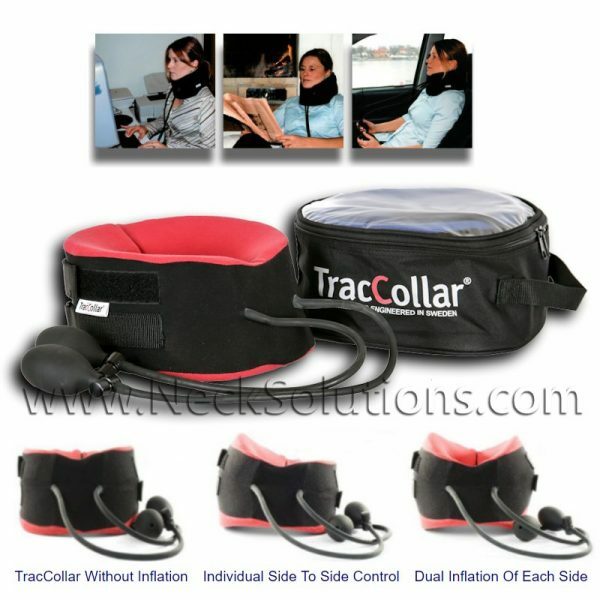 TracCollar is a combination of an air powered traction device and a cervical collar to provide the support of a collar and pain relief afforded by traction. It is lightweight and easy to use while watching Television, working at a computer or just surfing the internet. 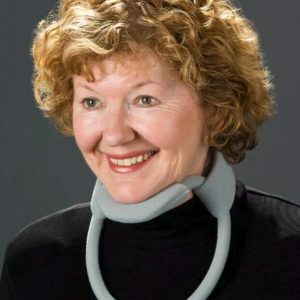 Because it works as a neck collar, it is easily used sitting, standing as well as lying down for relief from painful neck spasms, stress related tension, irritated nerves non-inflammatory arthritis and other neck issues. 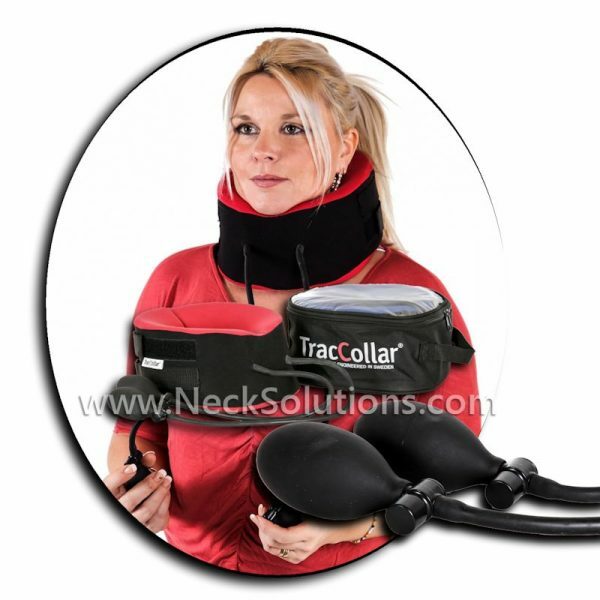 Trackcollar provides an effective means of using a home neck traction device offering individual control for each side of the neck. 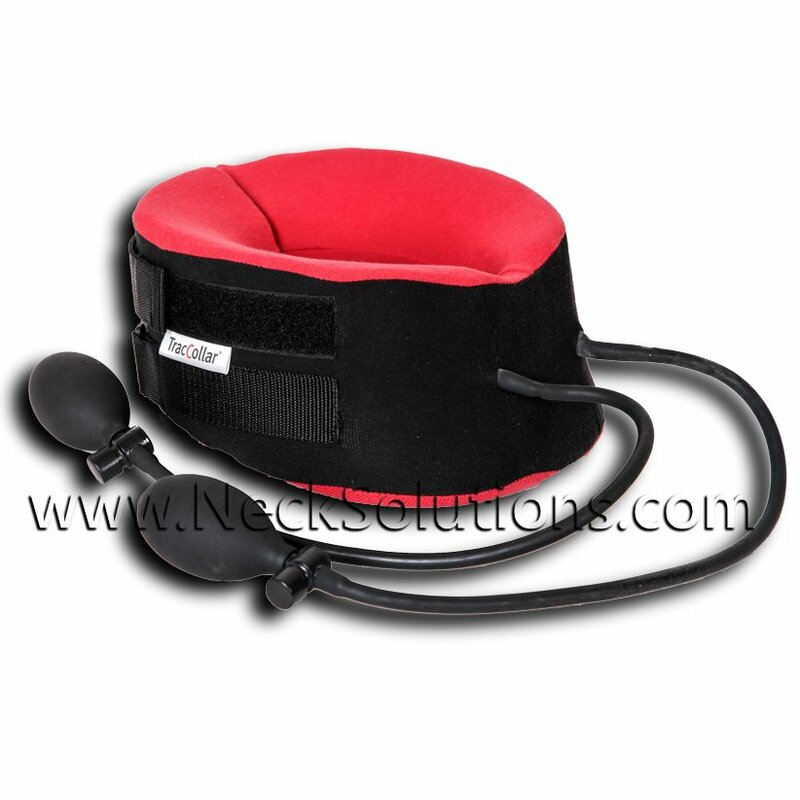 We have used this neck traction collar as an ALS Neck Support. 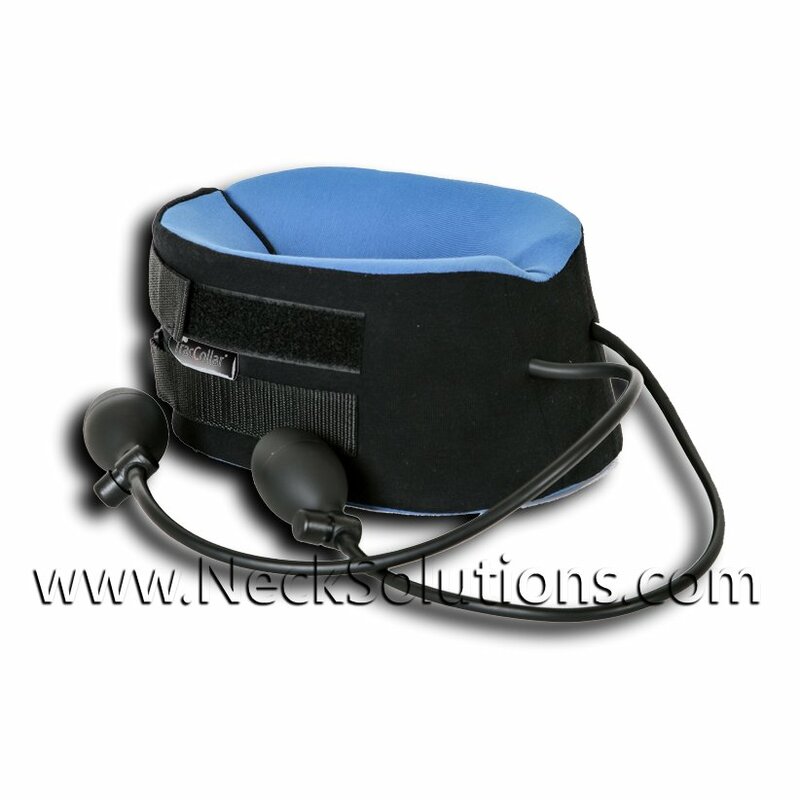 We at NeckSolutions did this as a request from a friend of ours who was impressed by the stability it provided when riding in his vehicle, and it was our pleasure having donated it to his family and strongly encourage supporting the ALS society. Traction is provided and should be used to your tolerance level. It should not cause pain. The advantage of having control over each side is that a disc herniation in the neck can place nerve pressure in different locations. This can be noted as a medial or lateral herniation and this means that different postures will bring about relief. Some will have relief with more traction on one side than the other, and the Tracollar gives you the advantage of this without having to bend your neck to one side against the force of resistance. 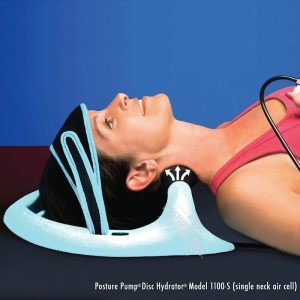 Additionally, scoliosis and problems with muscle spasm or contractions on one side more than the other will benefit with having the dual control inflation system. Like we have seen with ASL, muscle weakness or lack of control can benefit by having specific control provided on one side more than the other. This provides more comfort as well as treatment options. The collar uses foam inserts sitting on top and bottom of an inflatable bladder on each side. 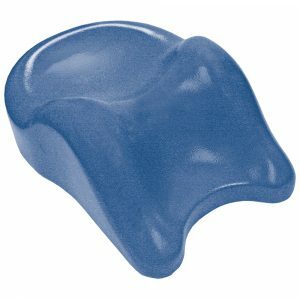 The foam inserts provide comfort because they are contoured, as well as stability to provide support. It is connected in the front and buckles in the back. The entire collar is surrounded by durable, yet comfortable material that is easily cleaned. The air pressure is applied and fine tuned by using a small inflation bulb. Only 15 pumps on each side are needed, so your hand will not get tired. When you are finished or need to release some of the air pressure, just press the button on the top of each bulb and the air quickly releases. It is available in 2 different sizes. You can measure around your neck with a tape measure or use your shirt collar size. 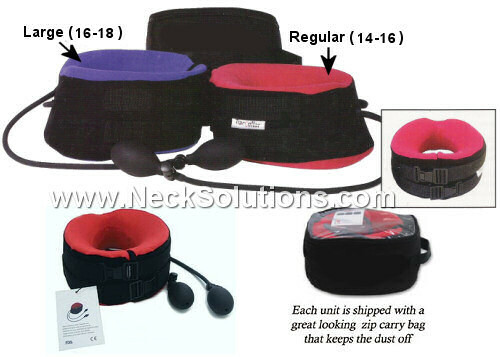 The regular size (red), fits neck sizes of 14 to 16 inches, and the large (blue) fits neck sizes 16 to 18 inches. If you are in between sizes, choose the large size. 1. The collar opens in the back, so make sure the buckles are open and are in the rear. Place it on your neck with the tubes and bulbs in the front. There is a contour depression in the front where your chin is placed for increased comfort and fit. 2. Once it is on your neck, close the buckles, which snap in, and then you can adjust the straps on the buckles to get a custom fit, making it tighter or looser. Adjust so that it rests comfortably in the front and back. 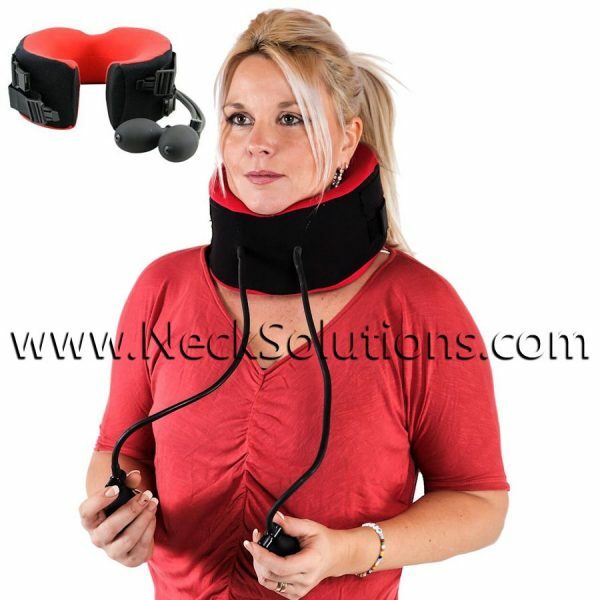 The collar does not have to close completely in the back, you will still be able to inflate each side evenly and comfortable with full traction effect. 3. For a traction session in the sitting position, keep your head facing forward and level. 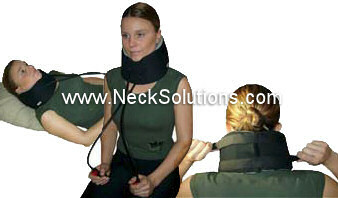 You can use the track collar without the traction as a general neck collar. 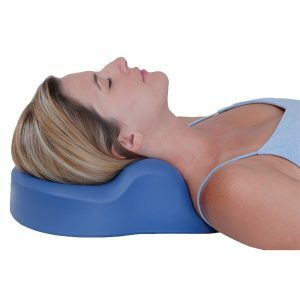 For use while lying down, simply place a comfortable pillow under your head and remember that you might not need as much traction force because you will not have the full weight of the head to lift. 4. Begin inflating the collar by squeezing the bulbs equally on each side until you begin to feel a stretching sensation in your neck. When you feel this, you can begin to inflate a particular side more than the other. Remembering not to inflate more than 15 times on either side, you can begin to feel the level that provides you with the most relief of your pain. The treatment should not produce pain. 5. Treatment should be to your personal tolerance level. At first, use for about 10 – 15 minutes, until you become familiar with how it works and how you will react to traction. As you progress, you may increase traction time or traction force, but not beyond 15 pumps per side. When you are done, simply press down on the release valves and the collar will deflate. Press the plastic release buttons on the buckles and the collar will come apart in the back. Then remove the collar and store it in the protective, travel case. Reviews are generally good. As with most products, some like it and some do not. 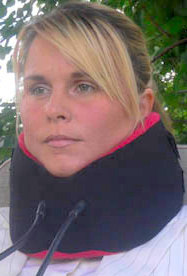 Some complaints associated with the traccollar are that it has limited sizing for those who have neck sizes under 14 inches or above 18 inches. 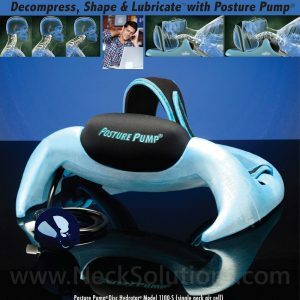 Another issue is that it buckles in the back and this can be a problem for those with shoulder problems or those with difficulty reaching around the back of the head. 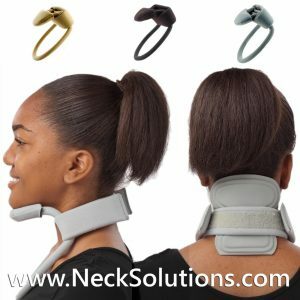 For those who have these concerns, we recommend the Latex Free Neck Traction Collar, which also offers individual control of right and left sides, but a wider range of neck sizes and is easier to apply. It also provides over twice the amount of traction force for those needing serious traction applications. Note: Traction is not meant to be applied to recent sprains and/or strains, neck injuries or other acute conditions where significant levels of inflammation exist. Should you experience any type of light headedness, dizziness or nausea, as well as any pain, stop use and consult a health care provider.